Enrollment – Our applications are rolling with the bulk of our applications occurring in early winter. After April 1, applications are accepted on an as-needed basis. PLEASE encourage your students to accurately complete the repertoire portion of the online application so that we assign new repertoire to them. Audition Details –We require two contrasting pieces and 1 two or three octave scale. The audition recording is used to determine placement in a group. Live and Recorded Audition Videos – Either a recorded audition video uploaded to the online application, or a live audition is accepted. A live audition is purely an alternative and holds no more weight in acceptance. Please find the timing and locations of our live auditions here. Music Teacher Recommendation Form – please complete the online, private recommendation form to help us review your student and assign appropriate repertoire. Please let us know any other information that will help your student succeed at PCP. 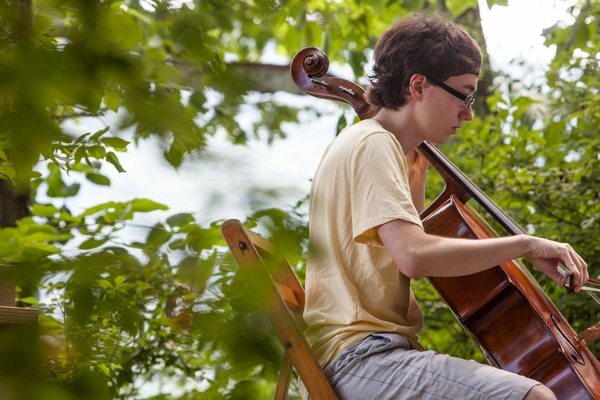 Auditions at camp for ensemble placement – All campers will play for the full faculty on the first Monday of camp before being placed in chamber music groups. Students should select two or three minutes of music that will, both musically and technically, show their highest level of achievement. Sight-reading is also expected. Pianists will be asked to play excerpts from their assigned chamber pieces – no solo pieces. Based on this on-campus audition, each camper is placed in two chamber groups. Pianists will have already been given a piece to prepare. The group begins to work, rehearsing six days a week. Each group rehearses in both coached and uncoached environments. Waiting List Protocol – Students are placed on a waiting list when we are still waiting for instrumentation and experience level from other applicants to make challenging groups. Students will be notified of their wait list status, and will be kept apprised when their status changes.